Michael Maltzen is more than just a celebrity architect with commissions for museums and luxury residences – he also designs for the poor, the homeless and underprivileged. 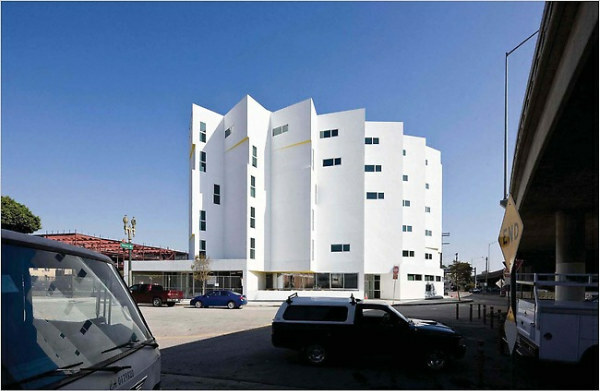 He recently completed work on the New Carver Apartments, an apartment complex for the recently homeless, elderly and disabled residents of downtown Los Angeles. 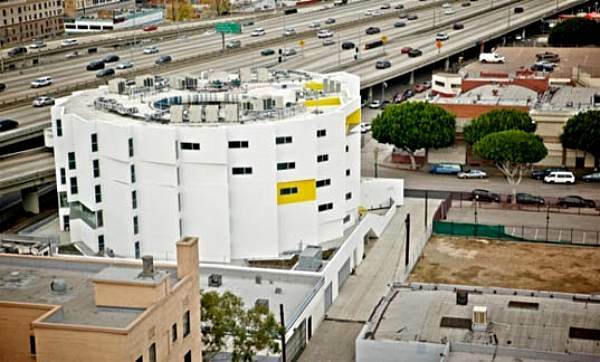 This isn’t his first commission designing for those who have less, in fact the New Carver Apartments are his third commission from the Skid Row Housing Trust, who provide housing for the downtown homeless population. The New Carver Apartments is a five-story, 57,000 sq ft apartment complex with 95 units, a community kitchen, laundry facilities and community rooms for activities. 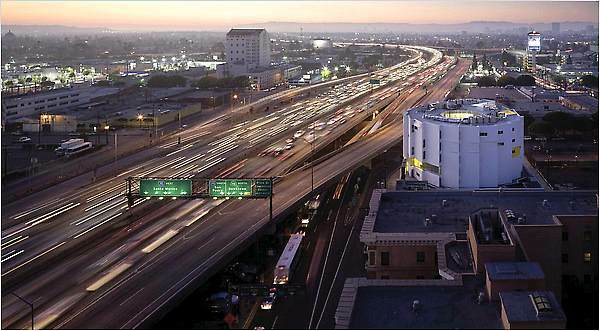 Built on a challenging site rite next to Freeway 10, New Carver had to be specially designed to fit in with its busy and noisy location, and at the same time provide a safe place for the residents. 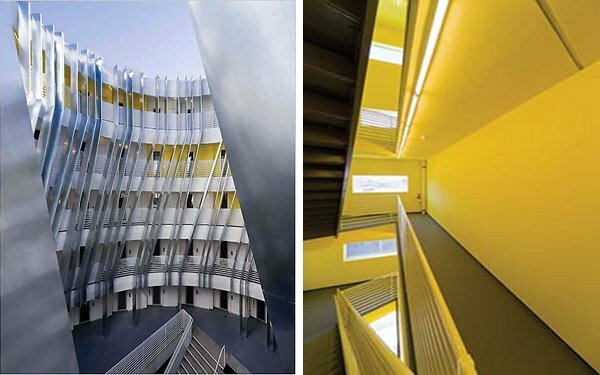 Matlzen and his worked hard to create a design that blocked out noise with a smart cylindrical design with efficiently placed triple glazed windows, so even at rush hour, there is just a slight hum. Even in the laundry and communal rooms on the third floor which overlooking the freeway and out towards downtown are quiet. The shape of the white cylindrical exterior is like a water wheel spun by traffic, and the fins angle the windows away from traffic and give the building a tough appearance. Inside, the five levels center around a central courtyard that pulls in natural light, and here it is safe and protected. Galvanized metal clad the service ducts and support columns and strong angles, which help provide residents with a sense of privacy. 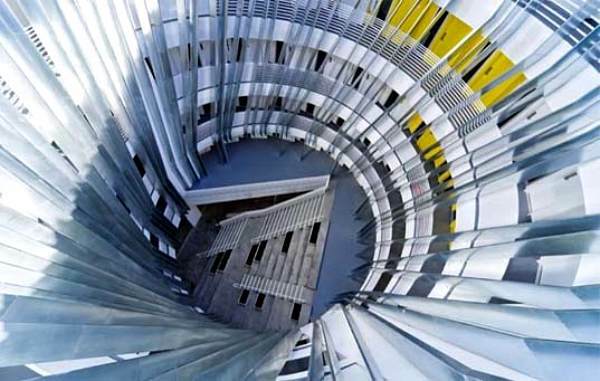 A large concrete staircase brings residents in from the lobby up to their apartments and community rooms. The word ‘hope’ is inscribed on the walls of the complex in several languages. 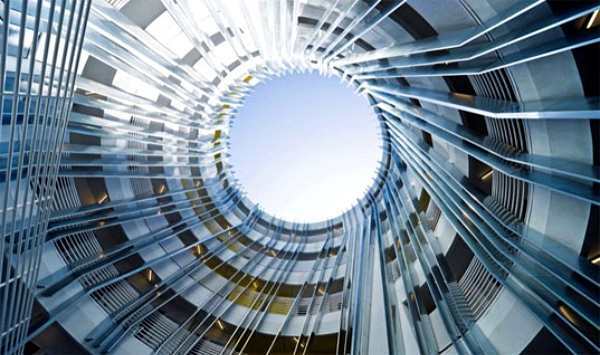 Maltzen’s newest social housing project is another example of how good design can improve people’s lives. 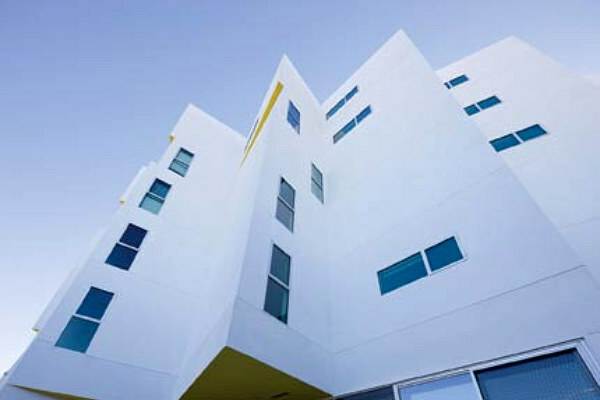 His buildings not only provide a place to live, but provide protection and a safe place from which to grow. 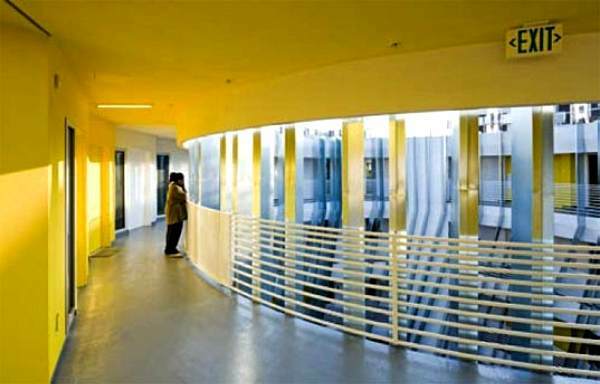 Maltzen, who worked for Frank Gehry in the late 80s and early 90s, also designed the Inner City Arts, an after school art program, as well as the Rainbow Apartment complex, both for Skid Row Housing Trust. We’ve come to realize the therapeutic value of good design,” said Mike Alvidrez, executive director of the trust. “There’s an optimism about our buildings. They indicate that there’s a solution to a seemingly intractable problem. On the street, the homeless wonder if anybody cares whether they live or die. Michael understands how to integrate architecture with our program and send a message to the larger community.” The word ‘hope’ is inscribed on the walls of the complex in several languages, and that is exactly what this apartment complex provides.